Purchased 1Password on the Apple Store when it was still a paid product, it now says read-only? It's been working fine for about three months, but now all of a sudden it's set to read-only mode and asking me to purchase the full edition. Switching to my personal Apple account in the App Store and restarting (app and laptop) does not resolve the issue. Is there a "restore purchases" button in 1Password that I missed? Or anything else I can do? Open 1Password and select 1Password 6 in the menubar. Hold down the control key on your keyboard. 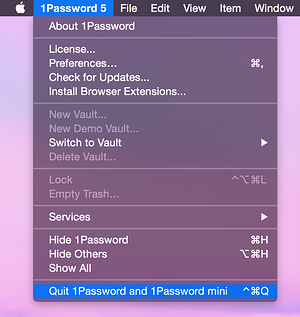 While holding down the key, select “Quit 1Password and 1Password mini” from the menu. Then, sign in to the App Store using the Apple ID that you used to purchase 1Password. Use the Purchases tab to re-download 1Password. The trick here is that 1Password is only allowed to check the Apple ID that it was installed with for purchases, so if you’ve installed it with an ID that does not have the purchase after the trial period it will enter read-only mode. I'll try your solution, but if at all possible I'd prefer not having to reinstall every few months... Any ideas what may have caused this issue to suddenly appear and what I can do to prevent it? I’m not aware of any issue with the App Store “remembering” what ID you installed an app with, but if you continue to have trouble please let us know.